Judge asks Sanji why he bothered saving them and he responds “that his father would be saddened to see him holding on to a childhood grudge and laughing at his blood relatives’ death.” Sanji tells Judge to forget that their father and son, Judge agrees. He promises that he will no longer come near Sanji or East Blue. 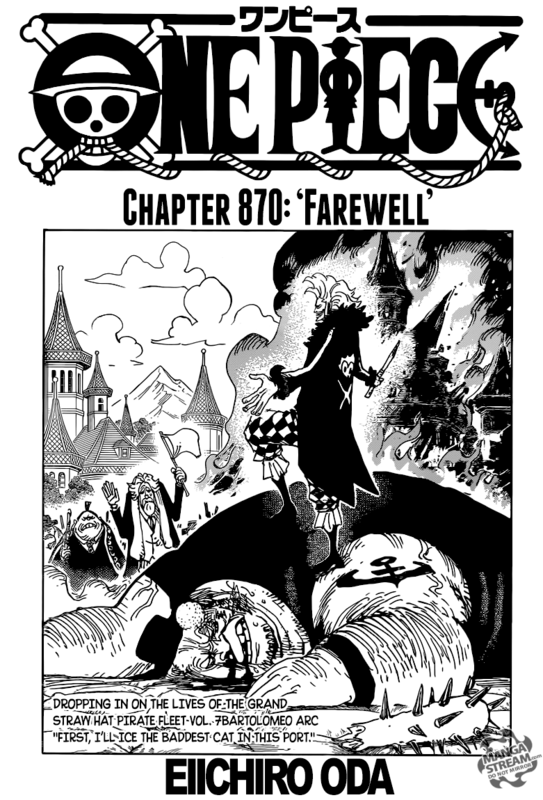 The Germa 66 plan on fighting against the Big Mom pirates, and since they all can fly on their own will not need to remain within Bege to escape. Bege surprises everyone with his concern for his crew, wife and son. Normally, it shouldn’t be surprising but Bege’s persona suggested that he would care. He comes up with a plan where he will return to his normal size and with Caesar reluctant help escape. Germa explains that they will help the alliance escape. 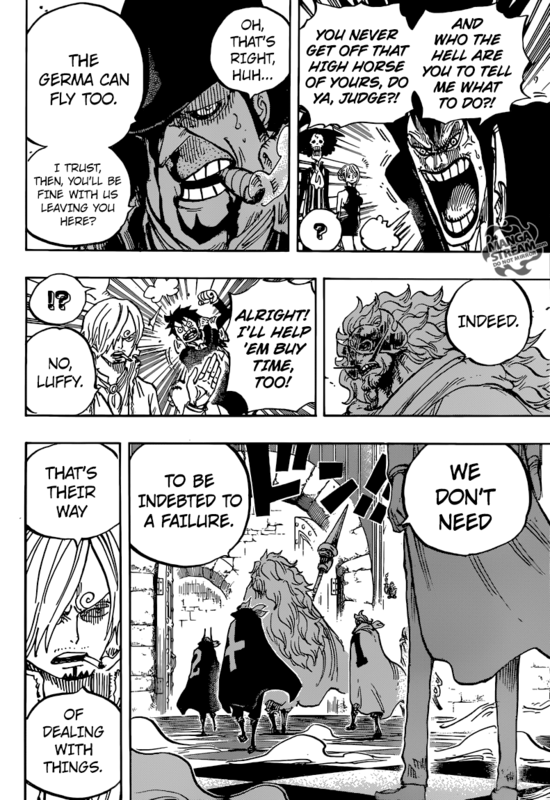 Caesar, the Vinsmokes, and Bege begin the plan. 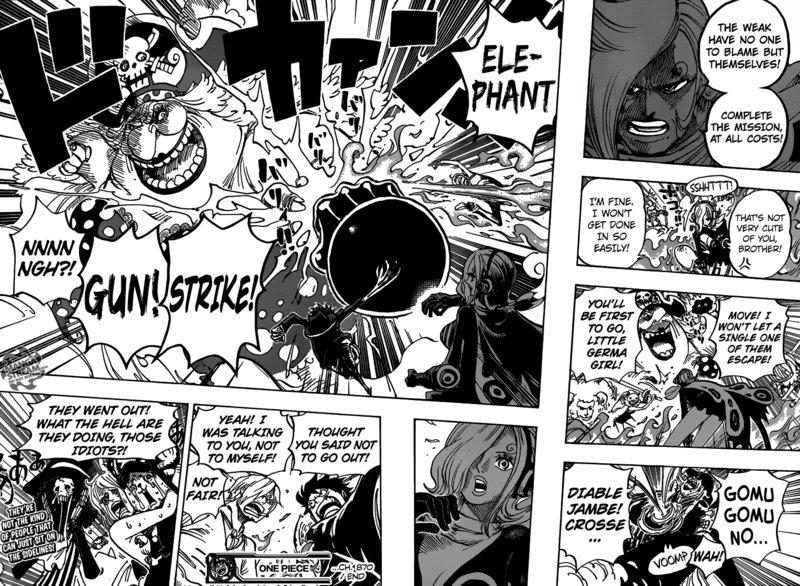 The Big Mom pirates open fire and are deflected by the Vinsmokes. 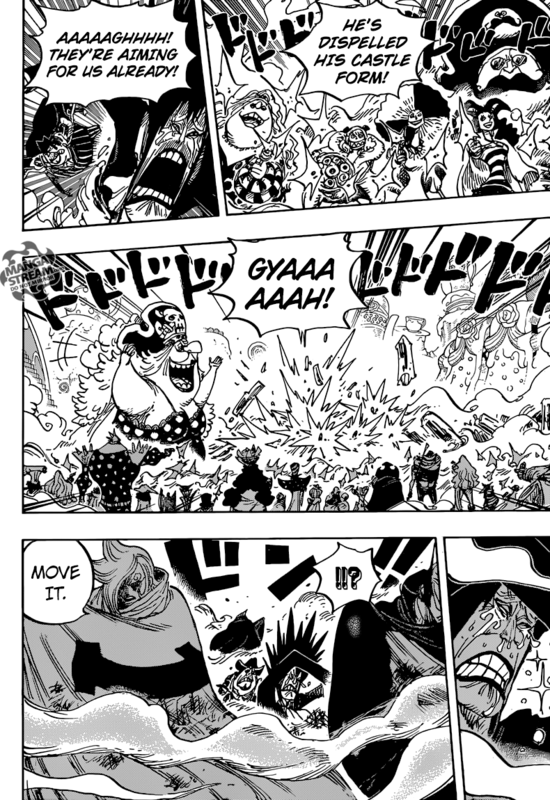 Big Mom attacks with Prometheus causing Reiju to be damaged, she then uses her fist and surprisingly both Luffy and Sanji counter her attack. I can’t shake the feeling that someone in the Strawhat crew is going to die. My most reasonable guess is that it will be Sanji. However, I hope I’m wrong. It seems that it’s more likely that the Germa 66 will fight to the death against the odds and ultimately be killed. While this won’t redeem them, it will help save the Strawhat’s and the Fire Tank Pirates. It is also possible that some third party, like the Sun Pirates or the army from the Germa Kingdom. Regardless, the stakes are increasing and this arc is reaching it’s climax.